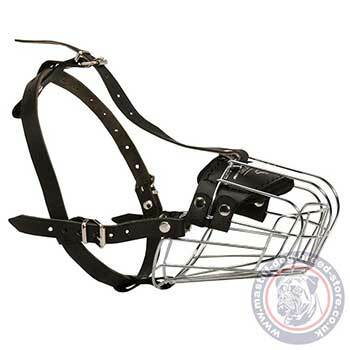 Get light, strong and perfectly ventilated wire basket muzzle with leather straps. Dogue De Bordeaux muzzle is the bestselling dog muzzle design, made up to individual dog snout form, size and breed features. Even two dogs of the same dog breed may have various snout sizes. We consider all the special features of each dog to pick up the best fit muzzle size for your dog. 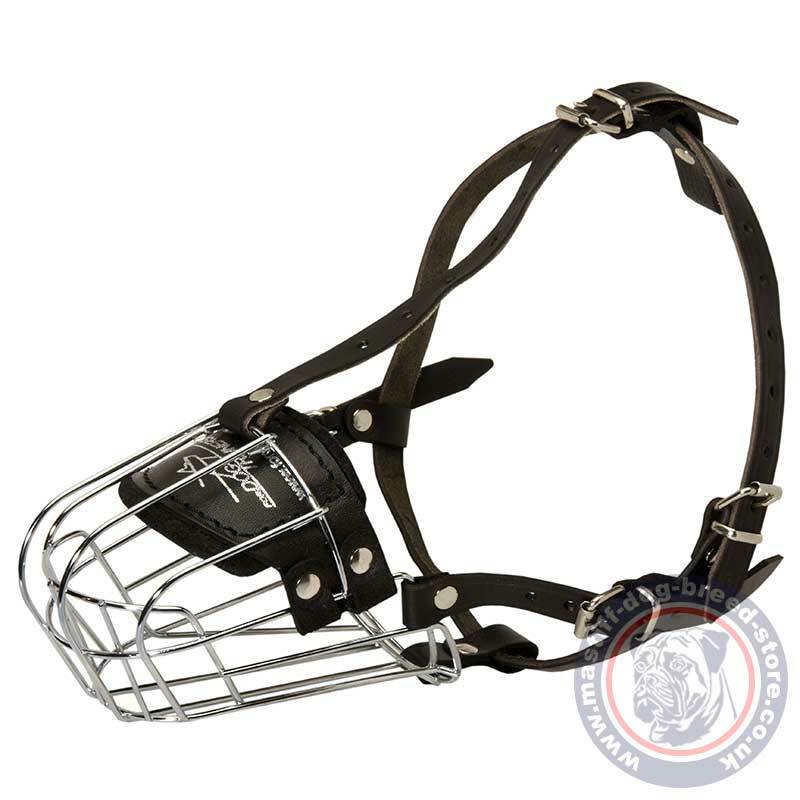 This basket dog muzzle is made in a wide range of sizes for various dog breeds. Dogue De Bordeaux muzzle size is broat and flat to fit its snout with maximum comfort and prevent tightening and rubbing. Basket dog muzzle is cast, smooth polished and rustpoof. It allows a dog to breathe free and even drink water muzzled. You just need a deep bowl with water for a dog to put the snout below the water level. Dogue De Bordeaux muzzle is made to be light and strong at the same time. It is reliably adjusted at dog's head with leather belts. The buckles are re-adjustable. 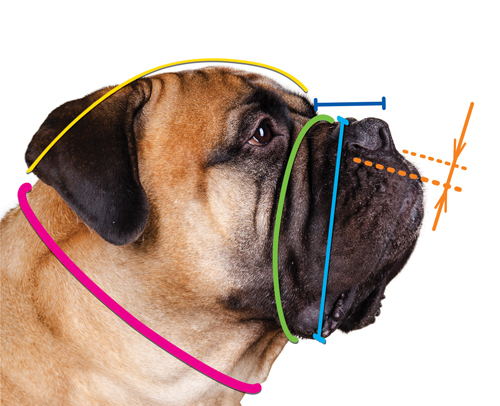 Fix it maximum fit for the head of your dog. The strap between eyes, along jaws and aroung neck will not let your dog take it off. Many people consider Dogue De Bordeaux an aggressive dog. Fortunately, it is not true. Dogue De Bordeaux temperament is calm and friendly. Though, this dog requires socializing, care, tender and loving attitude of his owner and family to grow a well-bred and obedient, calm and friendly dog. This dog muzzle will help you to protect your dog in public places from claims of surrounding people, for safety and comfort for vet visiting and for socializing with people and other dogs. Height: measure snout height. Dog mouth should be a little open. We produce Mastiff muzzles for over 20 years. We constantly use the professional skills and experience to improve the technologies and design of dog supplies to make them maximum comfortable, durable, functional and safe. Basket dog muzzle may create a wrong impression of a torturing tool. But let us assure you, that a correct muzzle size and design makes a dog feel free and comfortable and saves you from many troubles. This type of basket dog muzzle is indispensable for safe dog walking in public places, visiting a veterinarian, socializing with other pets, dogs and people. Strong wire basket is smooth, polished and cast. It is tested to prove the reliability in use under huge loadings. 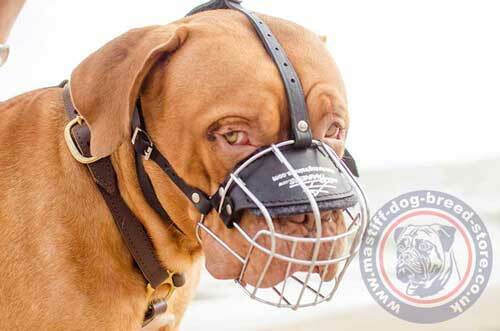 This Dogue De Bordeaux muzzle is soft padded, perfectly ventilated and securely fixed on dog's head. Turn your attention, please, that a dog muzzle does not resolve the problems of dog barking, dog aggression or dog behavior problems. Dog muzzle may prevent a dog from biting. But a strong dog may injure even with a muzzle on. If you wish to resolve these problems, we recommend to consult a dog trainer or a behaviorist.